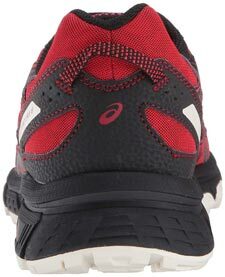 The Asics Gel Venture 6 is any runner’s top choice! It is one of Asics most stable shoe. Well, an ideal shoe is all you need. 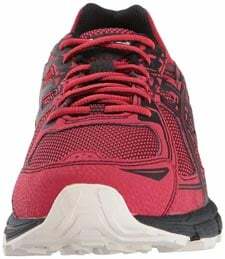 The Asics Gel Venture 6 is any runner’s top choice! It is one of Asics most stable shoe. The pair is designed to provide the ultimate running experience on all kinds of terrain. You will use them on rocky/hilly trails, muddy paths or unpaved roads. Venture 6 features some of the latest technology used on Asics shoes. These features include the gel cushioning system, high traction system, FlyteFoam midsole and AHAR(R} Sole. This combination ensures runners attain top performance with ease. The shoe is a rugged shoe ensuring great performance on a variety of surfaces. The removable sock liner allows runners with foot problems to insert orthotics. Its hard rubber sole makes it durable and tough. It has adequate cushioning. It doesn’t matter whether you are running through tough terrain or simply working out. Gel Venture 6 is designed to protect the foot against protruding objects, sticks or gravel. The shoe is made of synthetic lightweight material and stylish. The shoe tends to skid on wet flat surfaces. It doesn’t offer enough flexibility because of the hard rubber sole. The shoe has a narrow fitting. Venture 6 is built for runners with neutral gait. The upper mesh in Venture 6 is made from flexible and durable synthetic material. For added comfort, the shoe features a plush tongue and collar to prevent picking up sand and gravel on the trail. The traction improves the shoe’s performance by enhancing the grip of the shoe on various surfaces. A protective bumper at front shields your toes from any thorns or sticks on the trail. They come in different colors and stylish designs. Asics Venture 6 has a true fitting. However, some runners with wide feet have complained of sore feet after covering long distances. The shoe has a gel cushioning and adequate foam to protect your feet. Most runners find them comfortable even after long hours of running. Venture 6 is built for runners with neutral gait. These runners have feet that tend to slightly roll inward when running. This shoe is designed to support and maintain the arch of such runners. The shoe’s outsole has reversed lugs to provide traction on different surfaces. It provides the right traction for hilly and rocky terrains. The traction improves the shoe’s performance by enhancing the grip of the shoe on various surfaces. The split sections on the outsole also help to reduce the overall weight of the shoe. Asics Gel Venture 6’s outsole features the AHAR rubber technology. The tough sole enhances shock absorption and guarantees durability. You don’t have to worry about a damaged sole after few weeks of running. Gel Venture 6 comes with the exclusive Rearfoot GEL® Cushioning System that attenuates shock that a runner experiences on landing. It also allows for a quick bounce-back and transition. The sock liner can be removed to allow you insert medical orthotics. The upper mesh in Venture 6 is made from flexible and durable synthetic material. The design allows adequate air circulation to ensure your feet remain well aerated and dry. The mesh is also made from light fabric reducing the weight of this shoe. The supported back of the shoe maintains your natural pronation during running. A reinforced front ensures you don’t bump and hurt your toes while running. Venture 6 comes with a sock liner that features the Asics ComforDry material. This keeps the shoe moisture-free, enhances cushioning, and has antibacterial properties. The sock liner is also removable to accommodate orthotics. The fabric used is water resistant. You will not soak your feet when running in the rain. The shoes are also easy to clean and maintain. You can use the washing machine. What’s more? Venture 6 are laced up to allow the feet to slip in easily. It also has a “lace garage’’ that you can tuck away any lace ends that might cause you to trip. For added comfort, the shoe features a plush tongue and collar to prevent picking up sand and gravel on the trail. Are you a serious runner? Then you need this pair of shoe in your collection. Asics Venture 6 has a sharp tongue that enhances performance on the track. Its midsole is designed to give a fast stride turnover while on track. A protective bumper at front shields your toes from any thorns or sticks on the trail. The shoe also features a lightweight FlyteFoam midsole section. You wouldn’t like anything that weighs you down while on the track. These shoes are available for both men and women. The men’s shoe weighs around 11.2oz, and the women’s 9.0 oz. The shaft of Venture 6 measures a low-top from the arch. They come in different colors and stylish designs. The outsole is highly rugged to give traction and enhance grip on various surfaces. Its sole is made from tough rubber for strength and durability. Venture 6 has closed mesh keep out dirt and splashing water. The upper mesh also ensures adequate breathability. The Rearfoot GEL Cushioning System minimizes the impact effect. ASICS shoes are among the best-rated sportswear. The manufacturer incorporates exclusive technology to ensure the comfort of the runner is guaranteed, and performance enhanced. Venture 6 is an all-round pair of running shoes. It features all the characteristics of an ideal trail shoe; It is stylish, comfortable, versatile and affordable.